based on written Exam and interview for this GPSSB Vistran Adhikari (Sahakar) and AEO Jobs. GPSSB AEO, VISTRAN ADHIKARI (SAHAKAR) jobs exam will be conducted for 100 marks. GPSSB VISTRAN ADHIKARI (SAHAKAR), Agriculture Extension Officer posts exam will be held in the month of December 2018. Candidates must have Degree qualification along with Computer Knowledge for applying this Cooperative Extension Officer and Agriculture Extension Officer vacancies. GPSSB AEO Exam Pattern and Syllabus, Extension Officer (Cooperative) Exam Syllabus details are given below. There are total 59 Posts in this GPSSB AEO, VISTRAN ADHIKARI (SAHAKAR) jobs recruitment. Post Name and number of posts are given below. As on 26-09-2018 age limits are 18-35 years for this GPSSB VISTRAN ADHIKARI (SAHAKAR) and AEO Posts. Age relaxations are applicable for reserved candidates. Degree qualification with Computer Knowledge is required for these vacancies. Pay Scale : Rs.31400/- for both the posts. Application fee is Rs.100/- for unreserved candidates. 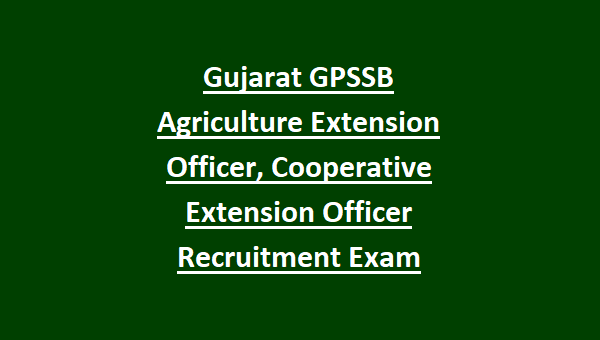 Candidates selection for this GPSSB Recruitment of AEO and Cooperative Extension Officer jobs will be based on written exam and interview. Written Exam will be conducted for 100 Marks for this GPSSB AEO and Extension Officer Cooperative Posts. Written test will consists of single paper only. Exam duration is one hour. 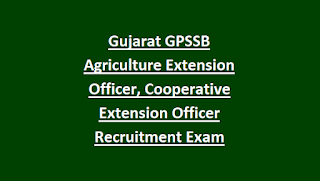 Apply online for this Gujarat PSSB recruitment of VISTRAN ADHIKARI (SAHAKAR) and Agriculture Extension Officer posts before the closing date of 26-09-2018.